Nebraska became a state March 1, 1867, the 37th state admitted to the Union. After statehood, Lincoln feuded with Omaha for the honor of being state capital. When Lincoln won, documents and office furniture were moved in covered wagons in the dark of night to escape an armed band of Omaha boosters. At that time, only 30 people lived in Lincoln. Today Lincoln is a major grain market. 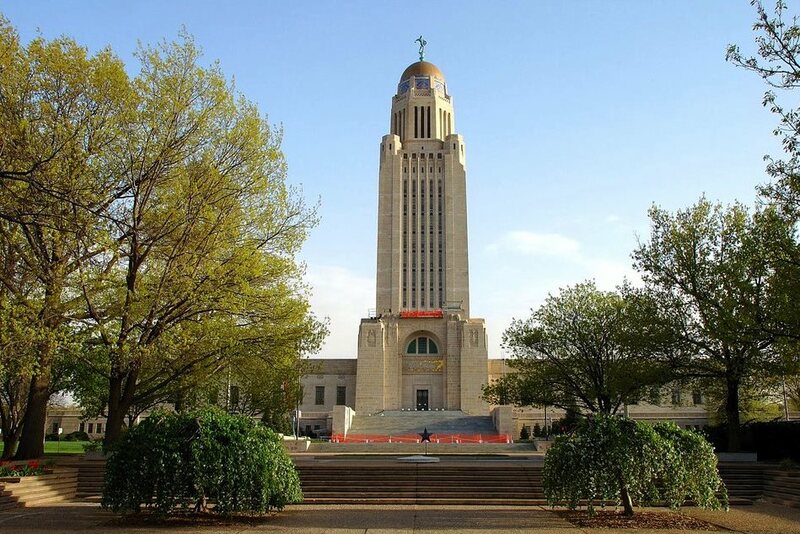 Its capitol, completed in 1932, has a bronze statue of the Sower atop its 400-foot central tower dome. Inside are reliefs and friezes depicting the history of law, justice and great philosophers. Nebraska’s unicameral form of government, the only one in the US, is of great interest to students of political science. The University of Nebraska is here, with statewide extension centers; also the National Museum of Roller Skating, with skates and costumes from 1700 to the present. In August the National Czech Festival offers Czechoslovakian foods, parades and polkas. The passion for parks, spread wide across the town; the high motivation of city planners with the Live Lincoln campaign, giving everyone the chance to speak out and participate; the urban forest and banners marking neighborhoods; the University atmosphere, Go Big Red. Mountains near: High Plains. Panorama Point, a rise on the High Plains on the west central border of the state, is the highest point in Nebraska at 5,429 feet.